Anyone else feel like 2018 has gone from the Long Night (a la Game of Thrones) right into summer? Suddenly we’re basking in the heat of the summer sun, which I love, but along with that come ticks galore and poison ivy creeping along the forest path and up my ankles. I’m looking at you, climate change (but that’s another conversation). 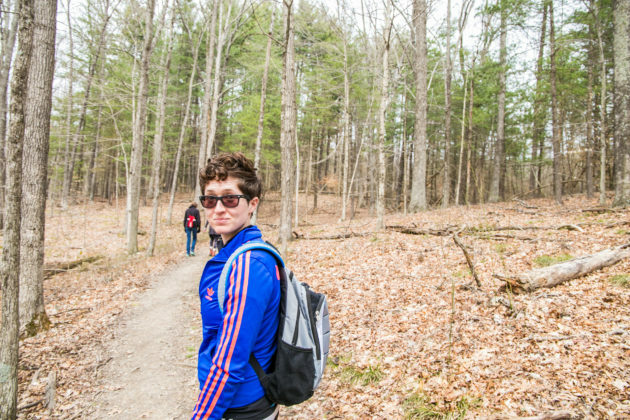 Here I am just a few weeks ago at Paynetown SRA at a Hiking for Health event, back when you still needed long sleeves outside. Photo by Danielle Kay Lucas. But don’t let these hazards stop you from enjoying the great outdoors. Here are some tips for making the most of your outside time this summer while avoiding the risks that come along with it. 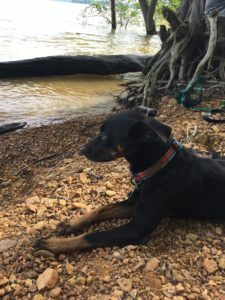 Jack loved our hike to this secluded beach on Lake Monroe last summer. He did not like all the ticks he got. Risks: In addition to being creepy, ticks in Indiana carry lyme disease and Rocky Mountain spotted fever among other less common illnesses. How they get you: Ticks like to hide in tall grasses, brush, and shrubs, where they can jump onto passing mammals. Protection: Use an eco-friendly bug spray whenever you go hiking. Wear shoes and socks that cover your feet. If you’ll be out in grassy or brushy areas, long pants and even long sleeves are encouraged. Wear a hat in the woods. As soon as you’re done with your hike, do a complete tick check of you, your kids, and your dogs. All dogs should receive a flea/tick repellent. Removal: If you find a tick that has bitten you, remove it with a clean tweezer placed as close to the skin as possible so you remove the head. Pull it out straight and don’t twist or squeeze. Put it in a solution of rubbing alcohol and water, then flush it down the toilet when you’ve gotten them all out. Last summer I found out the hard way that my dog’s tick medicine wasn’t working, when I had to pick 37 ticks off the poor little guy after a long hike! Risks: Though not common in Indiana, mosquitoes can spread West Nile virus, zika, and dengue. And their bites itch like woah. How they get you: Mosquitoes breed in standing water, so if you’ve got a puddles or a pond without a fountain on your property, you’re likely harboring lots of baby mosquitoes. Protection: Bug spray is your best defense. Treatment: Elevating and icing the bitten area will help reduce swelling, and if you have a lot of bites, take an antihistamine like Benadryl. Risks: Itchy, bumpy red rash and blisters that can cause severe allergic reactions in some people. Approximately 50% of people are allergic in some way. How it gets you: Poison ivy can creep along the forest floor and grow up the trunks of trees and bushes. It can last for weeks on your skin, and can be picked up from contaminated clothes, shoes, garden equipment, and pets. Protection: The best way to prevent a reaction is not to touch it in the first place, so memorize what it looks like and stay far away! Just a slight brush with a leaf causes a reaction in me less than 24 hours after the encounter. Treatment: If you know you’ve come into contact with it, take a shower as soon as possible (within 10 to 20 minutes) using soap. I have also used a diluted rubbing alcohol solution on a washcloth to immediately wash exposed areas and get the oil off my skin. Wash all clothing that might have been exposed. To treat the itchy rash, calamine lotion and topical steroids like hydrocortisone can work well for relieving the intense itching. 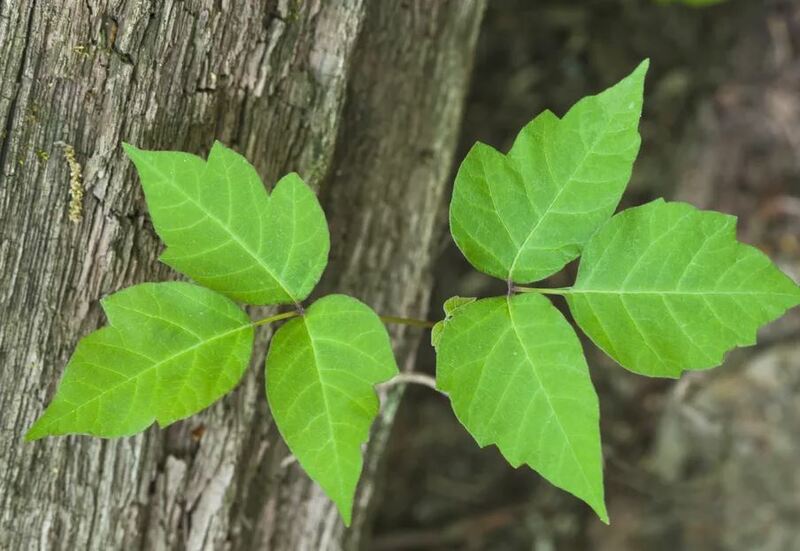 Poison ivy has three leaves originating from the same stem. They can have a reddish tint in early summer.